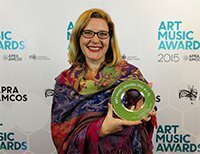 An outstanding group of individuals and organisations were announced as winners of the 2015 Art Music Awards at a ceremony held at Sydney's City Recital Hall on Tuesday evening 11 August 2015. The yearly gala event, organised by the Australian Music Centre and APRA AMCOS, celebrated the achievement and creative success of composers, performers and practitioners in the genres of contemporary art music, jazz and experimental music. Award for Excellence in a Regional Area: New England Conservatorium of Music for New England Sings! > Larry Sitsky at 2015 Art Music Awards: 'If we don't take our culture seriously, who will? > Performers and presenters at the 2015 Art Music Awards ceremony. Pictured (from top): Larry Sitsky; Iain Grandage; Bernie Heard (Gondwana Voices); John Davis (CEO Australian Music Centre).